We are a US-based company, located in Ohio, USA, therefore all product prices and shipping cost are in US-Dollars (USD). To obtain up-to-date exchange rate information, visit Yahoo finance at . We do our best to mark out of stock items on our website (you will see a red "No Stock" note next to the item name). Please keep in mind that we may not have the quantity or the style of the product (size, color) you desire on hand. We will attempt to contact you in such case and/or place your order on hold until more stock arrives. You can check the estimated arrival date and status of our next cargo shipment from Australia on the top right corner of our home page. To search for products, simply use the search box on the top of every page. The search engine will try to find matching products by comparing the exact spelling. If no products are found, similar "sounding" products will be displayed. Simple searches work best: try boots rather than black boots. Feel free to contact us to inquire about a product or suggest products you would like to see on our website. As our search engine is being constantly improved, please let us know if you have trouble using it, or cannot find products that you know we carry. Send an email to webmaster@simplyoz.com -- our Webmaster will surely appreciate your input. For added security, we also encrypt the credit card number when it is stored until your order is processed. We permanently discard your credit card number once your order ships, unless you specify that you would like us to keep it on file for future transactions. In any case, this information never travels or is stored in unencrypted form. Most orders ship from our Cincinnati warehouse in Ohio, USA (US-ZIP 45040) on the same day if placed by early 2:00 PM EST. IMPORTANT: The day your order leaves our warehouse is not counted as a day in transit. US Priority Mail (Post Office) delivery usually takes 2-3 business days in transit, however, this is not a guarantee. Standard Ground takes 1-5 business days in transit as outlined in the map below. The day of package pick-up is not counted as one of those days in transit. Also, weekend days are not counted as business days. 3-Day Select takes up to 3 days in transit following the package pick-up day, and does not include transit time on weekend days. 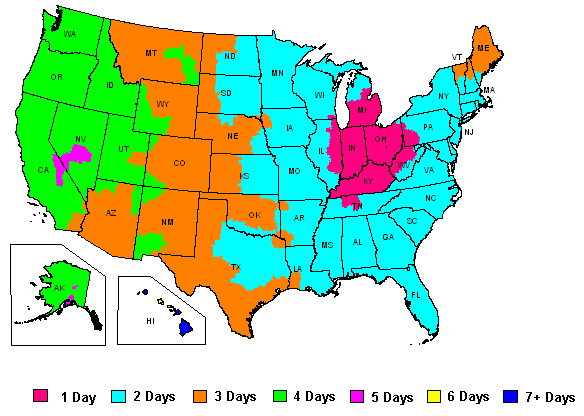 2nd Day Air takes up to 2 days in transit following the package pick-up day, and does not include transit time on weekend days. If you have questions or concerns about the estimated time of package arrival, please call us at 1-800-447-1187 or email us at info@simplyoz.com. *Shipping food is more expensive than you might expect because it is often perishable, and always very fragile. For example, a glass jar of Vegemite weights 1.5 pounds before packing , a pack of Tim Tams weights less than a pound, and a bag of Twisties weighs less than .5 pounds before packing, but they must often be packed together. Because of the weight factor and the fragile nature of food and in order to ensure as best we can that your purchase will reach its destination safely and intact, we use a combination of heavy duty burst strenth boxes, cardboard and bubble wrap cushioning,. Most orders ship from our Cincinnati warehouse in Ohio, USA (US-ZIP 45040). To determine your shipping costs, add the items you wish to purchase to the shopping cart and enter your "ship to" ZIP code on the Shopping Cart page. The shipping cost for the lowest cost method will be displayed. International orders are welcome. However, shipping costs cannot be calculated automatically at this time and will be added when we process your order. If you wish to verify shipping costs for international orders, give us a call or ask to be contacted before we ship your order. Please note, that shipping is approximate and may vary with actual weight. If you require help with your shipping and handling charges, give us a call. Shipping costs for international orders vary; please contact us for further details. In-stock items usually ship within 24 hours, Monday through Friday. Tracking numbers for orders are posted within 24 hours of shipping. International orders are welcome but are subject to delays for verification. Orders to Canada are not "technically" international, however, shipping charges cannot be calculated automatically for such orders and will be added during processing. We ship all orders from the USA. Although our online shopping cart cannot calculate shipping charges for non-US orders, here is a quick way to estimate your shipping costs for US International Mail. Add the items you would like to purchase to our online shopping cart. You have 2 items in your cart. The shipping weight is 2 lbs. Use this weight (2 lbs) to obtain a shipping cost estimate from the US Postal Service. Select your destination country and enter the weight in Pounds. We will use the rate for USPS Priority Mail International, plus $6.00 for packing and handling -- this is your shipping cost estimate. To complete the 2lb example, the shipping cost to Canada will be $37.60. Please note that shipping cost is approximate. It may vary by actual weight. If you would like to be contacted with the final shipping cost prior to making payment, please check out and select "Will Call with Payment," and indicate this in the comment box when placing your order. We now offer gift certificates on our website! Our gift certificates are the perfect solution when you just can't seem to find the right gift or you've waited till the last minute. You must have an account with us to purchase a gift certificate. Proceed to purchase a gift certificate. If you received a gift certificate from someone, redeem it after logging into your account or while checking out. Your purchase is uncommitted until you click the "Place Order" button at the Check Out page. You can check the current status of your order at any time by logging into your account. The order will be marked "Submitted" until we start processing it, usually the same or next business day. The order is marked "Processing" while we process your order; at this time we may contact you to clarify any questions. Once your order ships you will be notified via email. In-stock items usually ship within 2 business days. Tracking numbers for orders are usually posted within 24 hours of shipping. Customers are wholly responsible for the accuracy of the delivery address that is provided to us. We ship to the address you provide, and we cannot take responsibility for successful delivery if YOU do not provide the correct delivery address, including zip code and street address. It is imperative that you check and double check your shipping address before completing your order. Simply Australian will not accept responsibility for orders that are not delivered, or that are delivered late, due to address errors made by customers. During summer, and in areas with hot conditions, the company cannot be held responsible for the melting of chocolate products while in transit. We pack as well as possible to prevent melting, but once a package leaves our premises, it is out of our control. We recommend faster shipping methods and the purchase of ice packs. Please call for details. Your email address is kept confidential at all times, even if you sign our guest book or write a product review. We do not sell, trade, or rent any information we collect from you to third parties. Period. All transfers between your computer and our site that may include sensitive information are encrypted using SSL technology. Before placing your order, you will have the opportunity to review the product order form and make changes and additions to the information it contained and these changes will be automatically kept for future use. The information collected by Simply Australian is used for processing orders, keeping you informed about your order status, for statistical purposes, and for improving our site and its performance. We will disclose your personally identifiable information to third parties to charge your credit card, and to deliver your order. For example, we must release your credit card information to the card-issuing bank to confirm payment; and release your address to the delivery service to deliver products that you ordered. Your order details will be accessible to you through "My Account" with the username and password you selected for a period of 1 year. After this period, the order information is archived and only accessible by special request. At any time, you have the option to close your account by emailing us and we will discard your personal identifiable information. If for some reason you are not satisfied with your purchase and you wish to return it, please email or call to notify us. Return shipping is at customer expense. Defective products (non-food): In the case of a defective product, please contact us at 1-800-447-1187. Exchanges: If you choose to exchange your items, shipping is at customer expense. We suggest using a trackable carrier such as UPS or FedEx. Priority mail without Delivery Confirmation is not trackable and if the package is lost, we will not be held responsible for that loss. Return shipping is at customer expense. Once we receive your package we will notify you by email and credit the card you used for the purchase. Damaged goods (food products): While we do our best to pack orders carefully, transit damage does occur. If your product arrives damaged, we reserve the right to provide an in store credit on your account to be applied to future orders. We do not reship replacements for damaged food products that are delivered to the customer. If your food order is damaged in transit and returned to us, please contact us for re-shipment. Free shipping is for the original order only, return shipping for exchanges or refunds is at customer expense. UPS ground is used for tracking purposes and requires shipping to a physical address. For Alaska and Hawaii only priority mail will be used. Free shipping offer is for orders shipped to the continental US and Alaska and Hawaii. Shipping will be charged on all international orders. If you require a different size of a product than the one that was sent to you, please contact us. Once we receive your return we will send you the replacement size at no cost to you. See our Return Policy for mailing instructions and our return address.